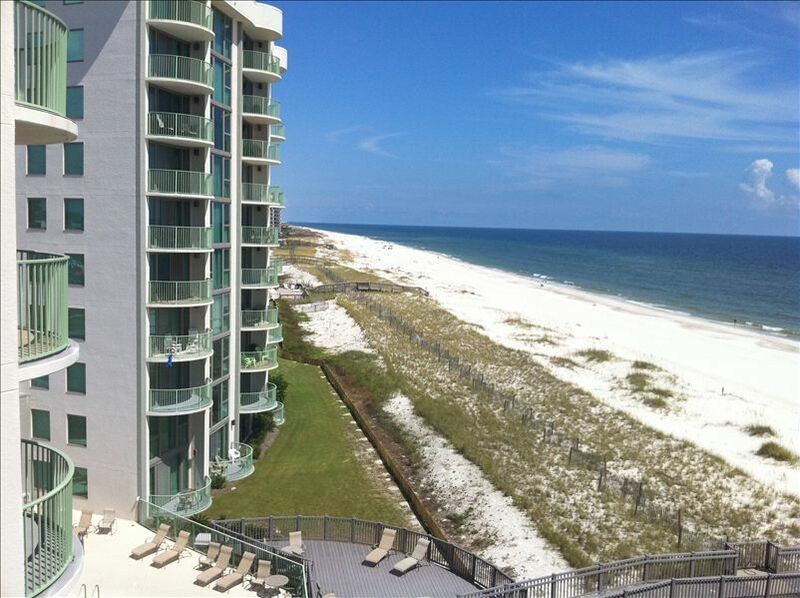 BEACH FRONT -Perdido Towers sits on the beautiful Gulf of Mexico. Professionally decorated with a semi-private elevator takes you directly to the Unit on the 6th Floor, no tiring walks around a building with groceries, luggage, or beach chairs!!! Fitness center, private tennis courts, and a heated pool downstairs. Bring your Boat and use our free boat slips and Private boat launch directly across the street on Old River. Perdido Key is Famous for 'peaceful' vacations. This Complex is GREAT for getting away from crowded beaches!!! Security system with entry codes provide added sense of safety for you and your family. Enjoy your own private balcony with an Unobstructed VIEW of white sands and Emerald Clear Water. Full length windows in the Master Bedroom/Living Room enables you to 'Be' on the Beach while in the comfort of a Luxurious and Spacious Condominium!!! Need a Heated Pool? Your family will enjoy the large heated pool with an expansive deck to fulfill the needs of the entire family. The pool is heated March - October. The pool house has exercise equipment and rest rooms just a few steps away. How about eating out? Close by find the best seafood in the world! If you want casual or upscale dining you will find abundant locations very near. Deciding between the Crab Trap less than a mile away, or the Shrimp Basket in nearby Orange Beach, the Oyster Bar just under the bridge to the east, or the Cobalt just west and under the bridge your need for food will be more than fulfilled. Entertainment? Visit the Naval Air Museum at the Pensacola Navy Base. Admittance is free! Be sure to enjoy IMAX. This is the home of the renowned Blue Angels. Shop until you drop at the Tanger Outlet Mall in Foley! Here you will find a great shopping experience. Consider The Wharf with great shopping & dining and the World’s largest Ferris Wheel. Locate the Amphitheater at the Wharf where great shows are regular events. Rent with confidence!! I am very happy to offer you a Great Condo at a Great Price. Our family has been vacationing in Perdido Key for many years. We love the family atmosphere and the uncrowded beaches. Perdido Towers offers Gulf front enjoyment for me and boating availability for my husband. We strive to provide a no hassle and enjoyable vacation for you and your family. Peaceful, family friendly, low density beaches. Food on Perdido Key is fantastic!! Food, peace, nature, and harmony in God's tranquil playground!! Balcony with tall table and chairs for unobstructed view. Floor to ceiling windows in living and master bedroom. Very friendly, helpful couple. Condo was beautiful and beach was quiet. Breathtaking views from inside and on the balcony. Highly recommend for a relaxing, quiet getaway but yet with abundance of options for places to eat and things to do. We hope to visit again! Loved the location! Condo was very clean and comfortable. Unfortunately, Hurricane Michael interrupted our stay. The owner was very understanding and fabulous to work with. We plan to return next summer! Sorry you had to cut your vacation short. Looking forward to having you return next summer! Comfortable furniture. Sure wicker looks good, but, it's not comfortable. If you like the posted pictures, you'll love this condo. Any shopping, parks, restaurants, etc. are all within a reasonable drive. The traffic in this area seems less hectic than further west. Thanks for the wonderful review! So glad our condo lived up to your expectations. Please come back and stay a little longer in beautiful Perdido Towers. Great location and spacious accommodations. Overall enjoyed our stay overall as the unit was more than big enough and was a great location. However the unit had several lights that were out so had to ask manager to bring some bulbs. Also observed a few dirty items: some dirty utensils, hair in the shower, spider webs in fake plants, and some air vents were covered with dark dust. Not to paint an overall negative picture but these were items that need to be addressed. Thank you for your detailed review. I will throw out any fake plants as they do seem to collect dust and whatnot. I delivered light bulbs within 24 hours of your letting me know. Other complaints are a housekeeping problem and will address them with my cleaning service. Sorry our unit did not meet your expectations. Great uncrowded beach, large clean pool, and comfortable beds in condo. Great condo for relaxing getaway. The bedroom view is amazing. We loved that the layout of the condo felt more like a home. Very easy process and communication with the owners. Bring your Boat, Get Away from Crowded Beaches, ENJOY Year-Round Tennis and Spectacular Sunsets !! !